FOUR-year-old children were among over 4,000 pupils suspended from schools across Northern Ireland during the last academic year. The 12 primary one pupils - among the youngest children in the school system - were suspended a total of 15 times including as a result of eight physical attacks on teachers. In total, over 15,500 school days were lost for pupils as a result of 6,805 suspensions issued during the 2016/17 academic year. These are among the key findings of an analysis by The Detail of suspension and expulsion figures obtained in response to a Freedom of Information request. Northern Ireland’s Children’s Commissioner Koulla Yiasouma said the number of school days lost by children was “very disturbing”. She also called for an end to the use of internal or informal suspensions by some schools which are not included in official suspension statistics. When asked what the department was doing about this issue, she said the department has no role in the day-to-day application of a school’s discipline policy and that any parent who wishes to complain should follow the school’s complaints policy. If dissatisfied with the outcome of that process, they can complain to the NI Public Service Ombudsman. We spoke to a number of school principals about their suspension figures. Two spoke about the need for suspensions at times in their schools but also confirmed they have dramatically reduced the number given during the current academic year by using restorative justice practices to deal with behavioural issues. Schools set their own discipline policy so the Department of Education said that discipline policies and their application are typically not comparable between schools. 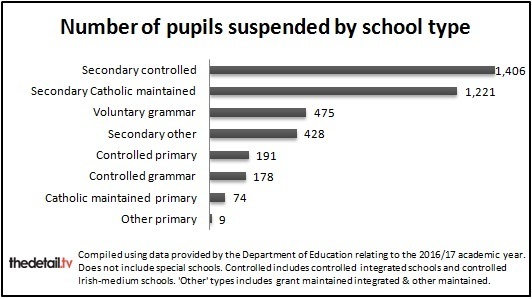 The vast majority of suspensions involved post-primary pupils (93%) and 77% of the pupils suspended were male. Of the pupils suspended, 75% attended non-grammar secondary schools. 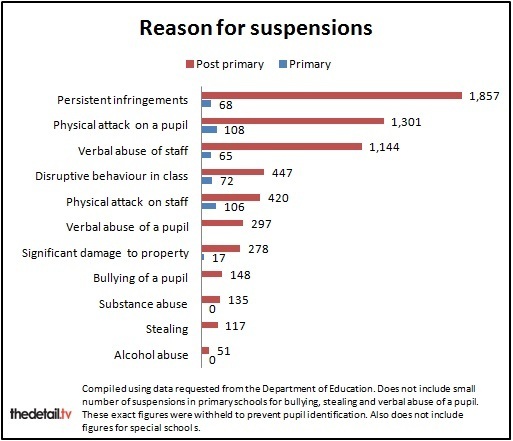 Over 1,000 of the maximum possible five-day suspensions were issued – including 115 to primary school pupils. Of the 1,061 schools we have information on, 17 schools suspended 50 or more pupils and 11 gave out 100 or more suspensions. A total of 33 pupils were expelled with at least one being a primary school pupil. Eleven of the expulsions were for ‘persistent infringements’, nine for physical attacks on pupils and others for substance abuse, disruptive behaviour in class, physical attack on staff and verbal abuse of staff/pupil. All schools must submit statistics on suspensions and expulsions to the Education Authority. The Detail requested a breakdown of this data from the Department of Education – including detailed information on the suspensions recorded by each school. Each suspension period can cover up to five days and some pupils will have been suspended more than once. An individual incident can lead to the suspension of more than one pupil or to a longer period of suspension, with each scenario generating multiple suspensions. A pupil can be suspended for a maximum of 15 days in a school term or 45 days in any individual academic year. A total of 625 pupils were suspended three or more times between September 2016 and the end of June 2017. The department’s data only covers pupils in Years 1 to 12 as this aligns with the compulsory school age (age four to 16) in Northern Ireland. The figures we are reporting on today do not include the suspension or expulsion of sixth formers or nursery school pupils. A single incident or having a couple of pupils with serious behavioural issues can greatly increase the annual figures at some schools. We requested information on the suspensions issued by all schools in Northern Ireland during 2016/17 and received a detailed statistical breakdown for 1,061 schools. Click on the interactive map above to see the data for each individual school. Seven hundred and twenty-one schools did not suspend any pupils during the 2016/17 school year – 664 primaries, 12 preps, 10 grammars, 8 secondary schools and 27 special schools – and 157 schools gave out less than five suspensions in total. The school with the highest number of suspensions over the year was Breda Academy, a secondary school in south Belfast, where there were 192 suspension occasions involving 81 pupils. The reasons included 74 suspensions for verbal abuse of staff, 57 for persistent infringements and 32 for a physical attack on a pupil. Breda was followed by Belfast Boys’ Model (182 suspensions). 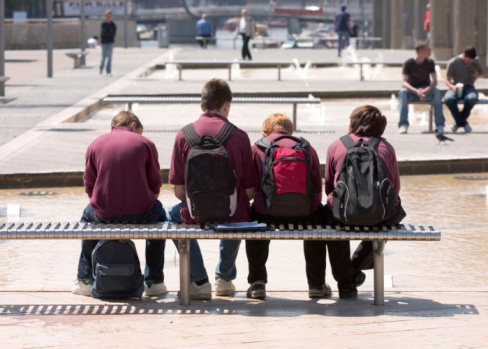 The school with the most individual pupils suspended over the year was Belfast Boys’ Model – 102 pupils – followed by St Louise’s Comprehensive (83) and Breda Academy (81). The primary school with the highest number of suspensions given was Ballyoran Primary in Portadown. It had 31 suspensions involving 16 children, including 19 given for a physical attack on a pupil. Alan Logan is the principal of Belfast Boys’ Model School in north Belfast which suspended 102 pupils a total of 182 times during 2016/17. The reasons for the suspensions included verbal abuse of staff (64), persistent infringements (42), physical attack on a pupil (48) and physical attack on staff (10). The Boys’ Model is a large, non-selective school with almost 1,000 boys on its roll during the last academic year - 58% of the pupils were entitled to free school meals and almost 52% had special educational needs. The school has 817 pupils of compulsory school age. Mr Logan said: “In this school every suspension is officially recorded. “As a post-primary, non-selective school our boys are doing very well in terms of outcomes. “We have a very strong pastoral ethos in the school along with a strict and clear discipline policy. This makes it clear that physical attacks on pupils or staff, bullying and verbal abuse of staff will result in a suspension. There will be repercussions but they are dealt with in a supportive way. “On returning from a suspension, we always have an interview with the pupil and parent and support can be put in place like mentoring or behaviour management counselling. “If a boy is physically aggressive, that has to be dealt with very strongly along with support and guidance to try and stop that happening again. “We are preparing our boys for life outside of school so we have to be very clear about what is acceptable behaviour and what is not. If they behaved in the same way outside of school, there could be very serious consequences. “I would stress also that an incident noted as a physical attack on staff can be, for example, a pupil pushing roughly past a member of staff when they are leaving a room. This is reflective of the reality of such incidents in our school rather than a possible perception that staff are being violently attacked, which is not the case. 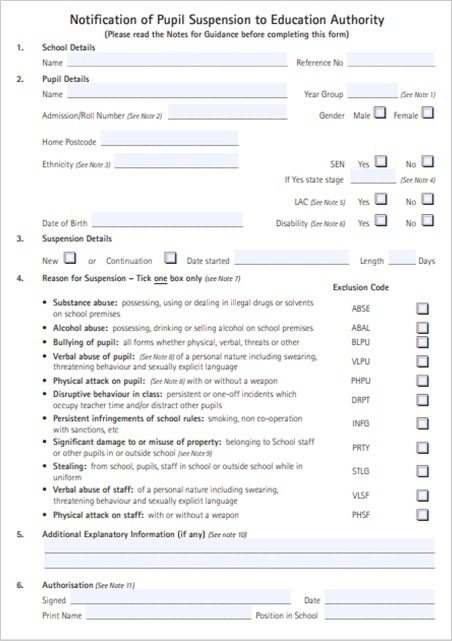 “The official Department of Education documentation which we complete requires us to report against broad categories of misdemeanour, so resulting data can be misleading in terms of the exact nature or relative severity of offences." The school now uses a restorative practice programme. Mr Logan continued: "As a result of this there has been a significant reduction in the number of suspensions during the first two terms of this school year compared to last year. This runs alongside our discipline policy. “The restorative practice involves bringing the pupil and injured party together to explain their sides of the story and how they feel. We usually find the pupil gains an insight into the impact his actions have had and he will apologise. As well as developing an understanding of what he did wrong, each boy is also encouraged to express his thoughts on why the incident happened in the first place and consider ways to avoid such triggers in the future. “We also have a much admired reward system in the school for pupils from year 8 to 14. All boys are encouraged to pursue both short term and longer term rewards which are accessible to all. “It would be misleading to believe that the level of reported suspension reflects poorly on the standard of behaviour and discipline within a school. I am confident in saying that this is not the case. Breda Academy, a secondary school in south Belfast, was the school with the highest number of suspensions over the year. There were 192 suspensions involving 81 pupils. Half of the school’s pupils are entitled to free school meals and 36% have special educational needs. Eleven schools across Northern Ireland gave out 100 or more suspensions over the year. At Breda Academy, the reasons included 74 suspensions for verbal abuse of staff, 57 for persistent infringements and 32 for a physical attack on pupils. Principal Matthew Munro said: “At Breda Academy pupil and staff safety is paramount. We maintain high standards of discipline as set out in our core school rules, that students should Be Safe, Be Polite and Be Ready for learning. In consequence we don’t tolerate threatening behaviour or abusive language towards staff. “Examination outcomes rose sharply at Breda Academy during the year in question, with the school rising 34 places in the GCSE League table 2018. The school did better than a significant number of schools with a lower percentage of students on free school meals – which would broadly indicate they had a more advantaged intake than Breda Academy. St Louise’s Comprehensive College is a large, all girls’ school based on Belfast’s Falls Road. Almost 40% of the 1,420 pupils have special educational needs and 60% are entitled to free school meals. Close to 1,000 girls of compulsory school age attend the school. St Louise’s had the second highest number of pupils suspended during 2016/17. Eighty-three pupils were suspended a total of 101 times, including 65 suspensions for persistent infringements, 20 for a physical attack on a pupil and eight for significant damage to property. The school’s principal Mary McHenry said: “High standards of behaviour are crucial in ensuring that children feel safe and learn well. “We work in partnership with parents and other stakeholders to support all students within a caring and nurturing environment while promoting positive self-concept to support the development of personal responsibility and self-discipline. "Through a range of rewards, preventative education and sanctions, including suspension, we aim to create a safe and secure learning climate for all students in which they are valued as individuals, encouraged in their learning as well as their emotional development. “We aim to be consistent and fair in our approach to ensure all of our students’ needs are met. Recent verbal ETI [Education and Training Inspectorate] feedback has complemented our students and parents’ own positive endorsement of the climate and relationships that exist when it was stated that: ‘Behaviour of students was exemplary in a friendly, welcoming environment. Students work collaboratively, relationships between students are outstanding with positive dispositions to learning. A real strength is the Pastoral Support Centre where students at risk of disengagement are fully catered for. People are in the right places at the right times and the school is a real safe haven’. Ballyoran Primary in Portadown was the primary school with the highest number of suspensions – 31 suspensions involving 16 children. The school did not respond to a request for a comment. Koulla Yiasouma, Northern Ireland Commissioner for Children and Young People (NICCY), said: “We welcome the publication of these key findings as they serve to highlight some very real and underlying issues that need to be addressed. “In particular I find it very disturbing that so many school days are being lost to our children and young people. Whilst I recognise the often complex and challenging lives of the children behind these statistics, it is very clearly not in any child’s best interests to lose days from school. “If a child is not at school, whether for a few days or longer, I expect that their education should be continued and appropriate measures are put in place to facilitate this. Mrs Yiasouma said the use of informal suspensions should “be stopped immediately”. “It particularly affects our most vulnerable children, including those with disabilities and special educational needs [SEN]. Additional and adequate support for these children must be provided so they have the opportunity to reach their full potential. “Anecdotal evidence is supported by NICCY’s casework experience which shows that some children with SEN are being informally suspended from schools in Northern Ireland. “As far as we are aware there is no formal or recognised definition of what is meant by the term ‘informal suspension’, and therein lies the problem. From our understanding it is an approach some schools take to manage certain pupils who have a range of behaviours. “Some parents tell us it is often presented in a positive light as something that means it won’t go on the pupil’s formal record and so will not affect their future onward prospects. There can sometimes be an implication that if parents don’t agree to the informal suspension that it will lead to a formal suspension or even expulsion. The Department of Education stressed it has no role in schools setting their discipline policy. A spokeswoman said: “It is a matter for the school principal and board of governors, in consultation with pupils and their parents, to set a policy which reflects the school’s unique circumstances and needs. She said that sanctions might include a reprimand, a letter to parents or carers, removal from a class or group, loss of privileges, confiscation of inappropriate items (a mobile phone or music player), detention, suspension or expulsion. We asked what the department’s view was on four-year-olds being suspended from schools in Northern Ireland. We asked what the department was doing about this issue. The spokeswoman said: “The department has no role in the day-to-day application of a school’s discipline policy. It is a matter for the school principal and/or the board of governors to explain their decision where a sanction is imposed.